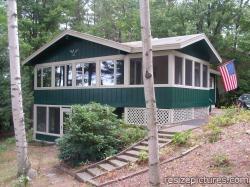 This is a great Lake Winnipesaukee rental. I would rate Tom's Cabin a 5 out of 5. Tom's Cabin is the place to stay after skiing at Gunstock Mountain in the Lake Winnipesaukee area. Very accurate and detailed description of the property with multiple pictures of the interior and exterior of the property. 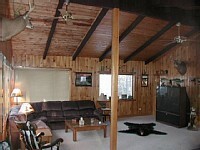 The cabin is extremely well maintained and appears in clean condition with all the appliances working properly. There is a gas fireplace in the living room that warms up the whole cabin very fast even in the single digit temperatures outside. The owner of the cabin is very friendly and responds to emails and phone calls right away. The price for the rent is reasonable considering 8 people occupancy and amenities provided. The cabin is located just a few miles away from Gunstock mountain and a few extra miles away from Walmart and Hannaford supermarket. I would definitely try to come back in the summer to enjoy the views and try fishing at Lake Winnipesaukee as well as do some hiking. Will also recommend this property to my friends! It sounds like Tom's Cabin is a wonderful place to stay any time of the year. Enjoying Lake Winnipesaukee in the the warm months and Gunstock for skiing in the cold months.